To stand in front of a Barbara Hepworth work is to understand sculpture's capacity to communicate living, restless energy. Her pieces have a life of their own. No-one could have described this quality better than the artist herself, when in 1937, she wrote: "When we say that a great sculpture has vision, power, vitality, scale, poise, form or beauty, we are not speaking of physical attributes... it is a spiritual inner life." Even her largest works do not look heavy or inert; they feel impulsive, animated, as though their stillness comes from opposing forces in equilibrium, rather than lifelessness. Hepworth's lines, hollows, creases and dimples are chosen with such sensitivity, that each sculpture has its own individual spirit. What's more, it is her abstract works, rather than her human or animal forms, that have the most personality: a testament to her artistic skill. 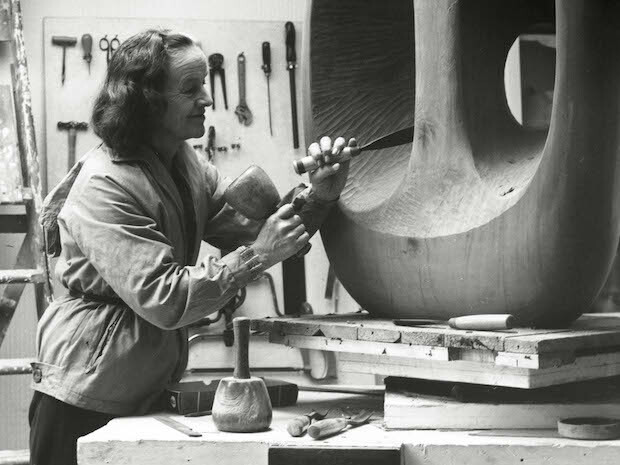 The Tate's 2015 Hepworth retrospective rightly removes the artisit from her peculiar 'Cornish female sculptor' shelf and places her on the international stage, as one of Britain's greatest ever artists. All of her Hepworth's best work is here, and to see it assembled is a real treat. At times, though, you can't help but wish that Tate Britain Director Penelope Curtis had let these sculptures speak for themselves. They are more than capable of doing so. 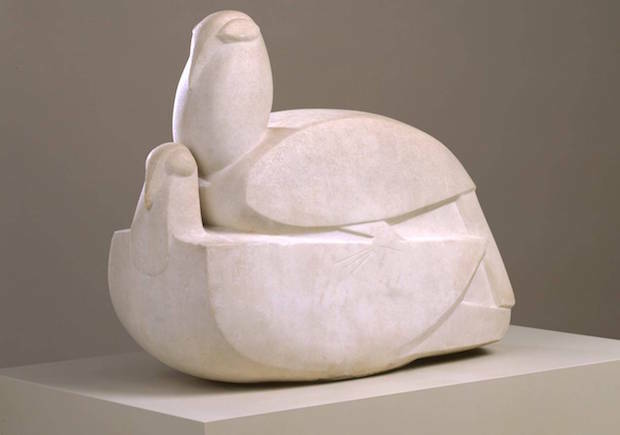 The exhibition, Hepworth's first major London retrospective since 1968, features over a hundred works. It opens with her earliest known carvings from the 1920s; before her conversion to modernist abstraction. Look out for the squat toad, a joyous little chap in Green onyx, and her series of torso studies. Hepworth's growing feel for abstraction is evident as we move through the rooms. Her wooden carvings of the 1940s and 50s are the undoubted highlight of the exhibition. 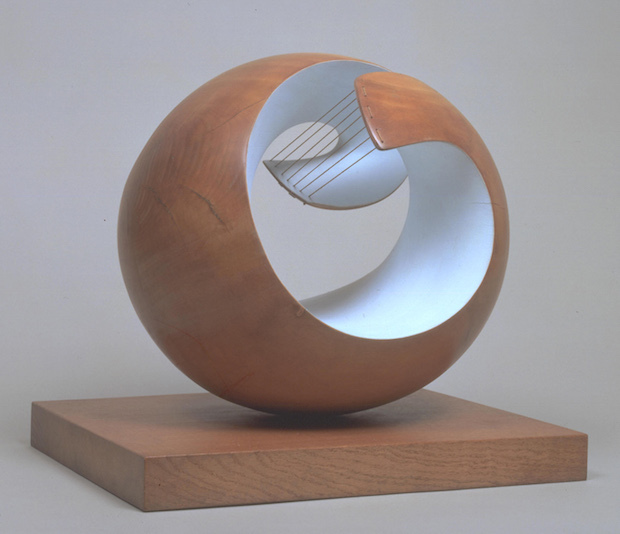 They reveal an artist in love with her material: Hepworth opens up highly polished wood, and creates interior spaces, which are painted for definition, and tautly strung with wires. It feels as though the artist has discovered secrets held in the wood, in the trees, and is revealing an inner life. 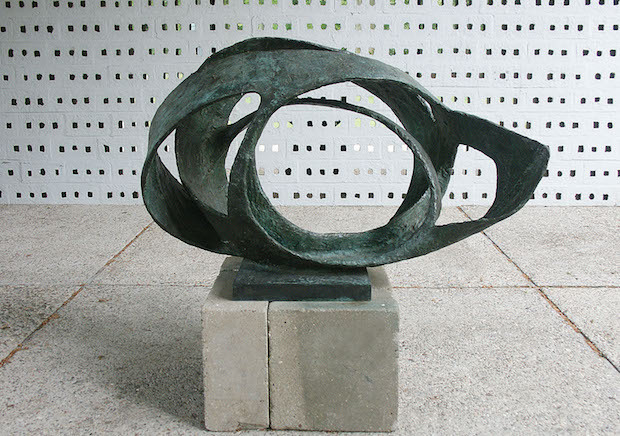 The retrospective makes a song and dance about placing Hepworth within wider contexts. At times, this is successful. The room Staging Sculpture is an interesting consideration of the way Hepworth saw herself as an an artist and presented her work, making use of photographs, film and photo-collage. In the final room of the exhibition, the Tate has recreated a 1965 Dutch Modernist pavilion in which Hepworth's works were shown, in order to illustrate her relationship with architecture. The resulting dialogue between the sculptures and their environment is fascinating; as you walk around the pavilion, her bronzes dominate, surprising you from around corners, taking over with their magnificent postures and struts. In one sense, however, this exhibition is a major disappointment. Given that this is the retrospective of a solo female artist, the male presence is frankly astonishing. The Tate claims to place Hepworth's sculpture "alongside works by predecessors and peers such as Jacob Epstein and Henry Moore". In fact, the works by male artists are here to chaperone, as though Hepworth's work needed buttressing. They are surplus to requirements. There is one (unbelievable) juxtaposition which illustrates this point. As you enter the wing, the first thing you see is an enormous pair of doves in flagrante, carved in Greek marble by Jacob Epstein. Brutish, bulbous, shrugging and arrogant, they dominate the entrance. 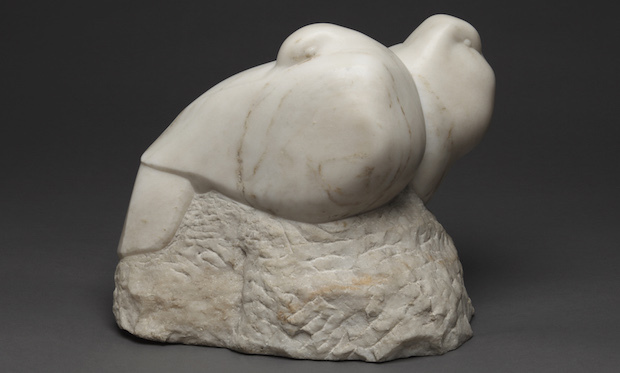 And then, mere feet away, dwarfed by Epstein's lovebirds, are Hepworth's own, much smaller, dove pair. These marble creatures sing of quiet tenderness; one rests its head underwing as the other keeps watch. These birds need no preface, and Epstein's hefty interruption is an impolite reminder of the way in which Modernism was, and is, a boys' club. 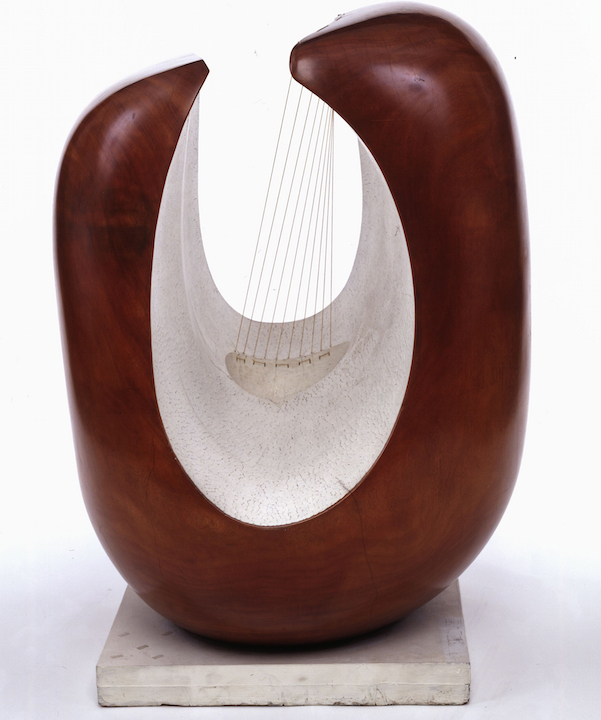 It's hard to believe, too, that so much would have been made of Hepworth's marriage, had she been a male sculptor. There is an entire room dedicated to the influence of her husband, the painter Ben Nicholson. Nicholson's works dominate the walls, crowding the sculpture, overwhelming them with colour. The reason for this, the Tate assures us, is because the pair "created work in dialogue", but wouldn't this be true of any artists that share a studio? We are, depressingly, instructed to observe the sway that Hepworth's husband had over her work, as the use of a human face in profile is traced from his art into hers. However, oppressive masculine intrusion aside, it is an unprecedented treat to have so many of Hepworth's pieces in one place. She was remarkable. A true work of art, said the sculptress, "has its own life and purpose." This could be applied to every Hepworth on display. We urge you to see it.